The New York Times bestselling coloring book from Millie Marotta--whose books have sold more than five million copies worldwide! Combining the smooth gel experience of a gel pen with the precision of a fine point pen and you’ve got yourself the perfect combination for precise penmanship. Color Luxe Fine Tip Gel Pens provide everything you love about gel pens; the sleek and smooth lay of gel ink makes writing and drawing a pleasure. And with a 0.7mm point tip Color Luxe Pens are great for the tiny details in handwriting. You can make your notes really small for more condensed note taking. Color Luxe comes in a set of 12 brilliant colored gel ink pens which are great for colored note-taking and fantastic for detailed gel pen art. 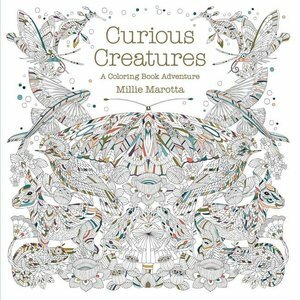 An enchanting adult coloring book from New York Times bestselling author Millie Marotta, whose books have sold more than 8-1/2 million copies worldwide! What awaits eager fans of Millie Marotta's magical art? In her fourth collection, the bestselling author of Animal Kingdom and Tropical World has created enchanting images of exotic flora and fauna to color in. Millie's engaging and intricately designed illustrations will beckon artists to make their mark on such creatures as an Amazonian royal flycatcher, macaroni penguin, mimic octopus, Tibetan fox, and golden pheasant, as well as a variety of plants, including rare orchids. Ideal for older children, these colored pencils feature an ergonomic triangular barrel and patented Soft-Grip zone. This ensures fatigue-free and comfortable drawing. The high pigmentation in the lead makes colors very vivid. Who doesn't love to color? As an adult, now that you can stay in the lines, you only need to think about what color to use! Rockport Publishers presents a series of grown-up coloring books for art and design lovers. Just Add Color: Wildflowers includes 30 original designs from artist and illustrator Lisa Congdon. From coneflowers and poppies to foxgloves and zinnias, you'll find 64 perforated pages of beautiful wildflowers to color and frame. You'll be inspired by the sumptuous artwork in this book, and the use of color is endless. Relax, have fun, and Just Add Color. Color Giant colors are brilliant, lightfast, smudgeproof, and waterproof. 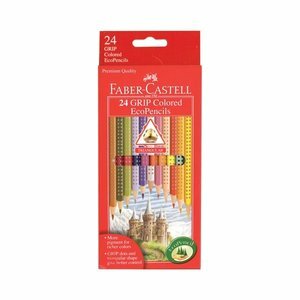 The hexagonal lacquered pencils come in a 12-pack of assorted colors including one each of the following colors, White, Lemon, Light Orange, Scarlet Lake, Pink Madder Lake, Light Flesh, Violet, Light Blue, Prussian blue, Sap Green, Venetian Red, and Black. Lyra Metallic Colored Pencils are in a class of their own, with highly pigmented, extra-thick 6.25 mm, break-resistant cores that last three times longer than regular colored pencils. Color Giant colors are brilliant, lightfast, smudgeproof, and waterproof. The hexagonal lacquered pencils come in a six-pack of metallic colors, including one each of the following colors: Metallic Brown, Metallic Yellow, Metallic Green, Metallic Lilac, Metallic Gold and Metallic Silver. Gold and Silver go great together in this fabulous set of classically colored metallic markers. Precious Metals Metallic Markers is a set of markers with glorious gold and silver metallic colors that’ll give your artwork a special look. Precious Metals have a super fine 0.7mm tip so you can create wonderfully detailed art that leaves a sheen of amazing color. Plus Precious Metals writes on black paper for a truly unique look. Set of 2. From the same ink artist and original publisher who brought you SECRET GARDEN and ENCHANTED FOREST (both international bestsellers), comes an exciting new coloring format: the poster book. 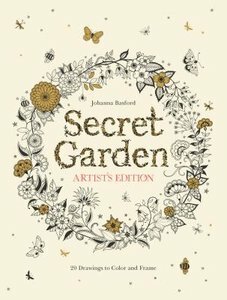 Over-sized, printed on a single side on extremely thick card stock of 400 gsm, and easy to pull out for framing, SECRET GARDEN: THE ARTIST'S EDITION provides larger spaces for an easier coloring experience. This poster book features 20 enlarged designs from Johanna Basford's first book, SECRET GARDEN, currently a #1 New York Times Bestseller. Color an amazing tower, all the way from a boat bobbing in the waves, past sea dragons, mermaids, aqua robots, and sharks, to reach the deep ocean floor. Hours of fun for coloring enthusiasts of all ages. Lose yourself in a riot of beauty and mindful drawing with New York Times bestselling adult coloring book author Millie Marotta--whose books have sold more than 8-1/2 million copies!! Created by the bestselling author of Animal Kingdom, this is one of the most gorgeous adult coloring books out there. Millie Marotta's intricately designed tropical world beckons would-be artists to enter and make their mark. Add bright and brilliant colors to exotic blooms or a parrot's feathers. Complete a rainforest scene, draw fine lines on the palm trees, create new patterns, or use your creativity to personalize the illustrations. It's a wonderful way to fire up your imagination and relieve stress--and the high-quality paper makes it perfect for color pencils. Breathe life into beautiful cityscapes with the Urban Cities Travel Size Color-in’ Book. Buildings, houses, roads, bridges and more are waiting for you colorful imagination in this wonderful mini 24 page coloring book. The coloring pages are small enough to fit in any bag, but large enough for amazingly colorful creations. Measures 8.5" x 6"
Whether you want to unplug completely or be creatively engaged while commuting or watching TV, this adult coloring book offers 72 pages of beautiful and meditative floral designs. 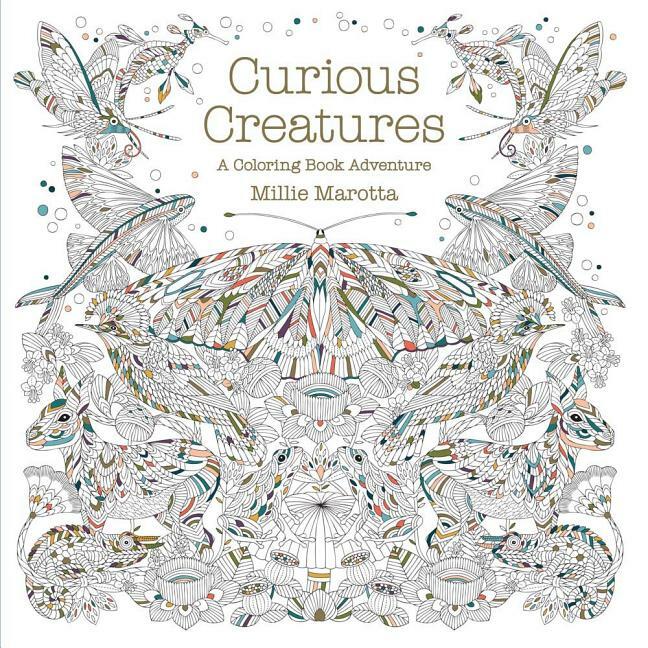 A gorgeous new adult coloring book from New York Times bestselling author Millie Marotta, whose books have sold more than 8-1/2 million copies worldwide! Millie Marotta is one of the most popular creators of adult coloring books--and this beautiful volume features stunningly sophisticated patterns inspired by the savannah. Her intricate black-and-white drawings capture a myriad of the flora and fauna found in that breathtaking landscape, including elephants, rhinos, zebras, and ostriches. The high-quality stock is perfect for color pencils, as well.